Before the South Carolina primary, casino mogul Sheldon Adelson gave $5 million dollars to an independent PAC supporting Republican presidential candidate Newt Gingrich. That worked so well that a second $5 million dollar gift was soon on its way to that same pro-Gingrich PAC, Winning Our Future, keeping the former House Speaker in a tight two man race with Mitt Romney. There is more where that $10 million came from. How does Robert Reich, former Bill Clinton cabinet member, and noted public policy analyst, respond to this pairing of Gingrich and Adelson? He claims not to know what lies behind the Adelson support for Gingrich. I believe Reich feigns ignorance in his blog posting, rather than admit the obvious, the linkage of Jewish money to American politics, which we all know, is a taboo topic for establishment media types. Do you know who Sheldon and Miriam Adelson are? Do you know what Gingrich has promised them, or what they think they’ll get out of a Grinch presidency? I don’t. But if Newt becomes President of the United States, they’ll be singularly responsible. And we better find out, because Newt will owe them big time. Reich is right about the influence a rich contributor like Adelson will have on the President. If he thinks he is being funny, I am not laughing when he feigns ignorance about the tight bond between Gingrich and Adelson on their shared passions of conservative political ideology and devotion to Israel. It is not just the American right that is Adelson’s great political passion. There is also Israel. Always proud of his Jewish heritage, Adelson’s activism took a pronounced leap when he married his second wife, Miriam, in 1991. She was an Israeli citizen who had been working in New York. The Adelsons are friends of Israel’s prime minister, Binyamin Netanyahu, and Adelson purchased a Hebrew-language newspaper to support him. Adelson is an impassioned opponent of an independent Palestine. He has given at least $60m to the charity Taglit-Birthright, which brings young Jewish Americans on trips to Israel. He has established a thinktank in Jerusalem and given large sums of cash to Yad Vashem, the Holocaust research centre. In the US he has donated to the lobbying group the American Israel Public Affairs Committee, helping fund the trips of Republican congressmen to Israel. All of this dovetails with Gingrich’s policies on Israel. Gingrich has vowed that on the very first day of his administration he would order America’s Israeli embassy to move from Tel Aviv to Jerusalem. He has called for regime change in Iran and repeatedly denied that Palestinians are a real people, saying instead they have been “invented”. Sheldon and Miriam Adelson want to put Newt Gingrich in the White House to guarantee what they perceive to be Israel’s best interests. There is no doubt in Candidate Gingrich’s mind what links him to Adelson. “Sheldon Adelson’s passion in life is the survival of Israel,” Mr. Gingrich said. “And he and I are in agreement that Iran is in deep, immediate threat of posing the risk of a second Holocaust” with nuclear weapons. Indeed, the evidence shows clearly that many Americans would be perfectly willing to play hardball with Israel when it acts in ways that are not in the U.S. national interest. For example, back in 2002, a Time/CNN poll found that 60 percent of Americans supported cutting off aid to Israel if it did not respond to Bush administration demands that it withdraw from areas it had occupied (during the Second intifada). One year later, a survey by the University of Maryland reported that over 60 percent of Americans would be willing to withhold aid to Israel if it resisted U.S. pressure to settle the conflict. So when Congress passes various “pro-Israel” resolutions by amazingly lopsided votes, when its members rise as one to give Netanyahu standing ovation after standing ovation, and when U.S. presidents feel compelled to backtrack from efforts to advance a two-state solution before it is too late, it is not because the “American people” are demanding these responses. As in many other cases (such as financial regulation, gun control, health care, or farm subsidies), politicians are ignoring the will of the people because a well-organized minority (comprised of some but not all American Jews and some but not all Christian evangelicals) is making its support conditional on support for its hardline views. It’s the classic story of interest-group politics: If a small minority cares passionately about an issue and the rest of the population cares less, politicians will pander to the few and ignore the many, even as evidence accumulates that the resulting policy is wrongheaded. In this case, our present policy towards Israel is harmful to the long-term interests of both the United States and Israel. Friedman is no dummy. He is fully aware that Newt Gingrich would be a disaster for Israel if he makes it to the White House. The one thing Israel does not need is to be indulged by the United States government in its increasingly paranoid view of the “neighborhood” in which Israel lives. I sure hope that Israel’s prime minister, Benjamin Netanyahu, understands that the standing ovation he got in Congress this year was not for his politics. That ovation was bought and paid for by the Israel lobby. This Friedman column is a wake up call to America where polls, as Walt suggests, tell us the public does not want to indulge Israel to the degree Israel’s “friends” believe is appropriate. It is increasingly clear to this reporter that the only rational way out then will be to negotiate, not as victors, but as an honorable people who lived up to their pledge to defend democracy, and did the best they could. Thomas Friedman has not yet attained the stature of a Walter Cronkite, but on the subject of Israel, Friedman has the credentials to speak to what is best for both Israel and the United States. In this column he did so. 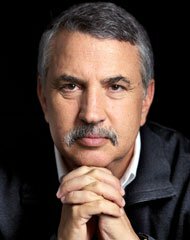 It is time for voters to listen to Tom Friedman. For, as blogger and Middle East scholar Juan Coles, wisely notes, time is running out for Israel. It is unrealistic to think that little Israel, with about 7.5 million people (20% of them Palestinian-Israelis), can forever dominate militarily some 400 million Muslims in its neighborhood–Muslims who overwhelmingly side with the Palestinians. The alternative is to make peace, and peace requires a settlement of the issue of Palestinian statelessness and a drawing of final boundaries in Israel’s land disputes with neighbors. On this point, I believe Walter Cronkite would concur. This entry was posted in Media, Middle East Politics, Politics and Elections and tagged Friedman, Gingrich, Palestine, Romney, Sheldon Adelson, Stephen M. Walt, Taglit-Birthright, Winning Our Future. Bookmark the permalink. As long as congress ignores the wishes of the majority of the American voters and being rubber stamp to the pro-Isreali lobby ,congress is to BLAME for the failing foreign policy around the world and ESPECIALLY the issue of Palestine is costing the USA billions of dollarts and American lives while members of congress and presidential candidates embarrassing us by extending their hands out to the israeli lobby .Are you(congress) not ashamed of yourselves???? . Excellent piece, Jim. I’m sharing on my own Facebook page as well as my peace group Facebook page. Thank you! Jim: An excelent writing. Congress can indeed ignore the will of the America people with a well-organized minority. I have seen that happen often when I was a member of Congress. But perhaps if writers such as Tom Friedman speak out on the subject of Israel and Palestine our nation can be saved from the ultimate disaster.otheriwise awaiting our nation. Harris Fawell, Member of Congress, Retired. Thanks Jim, I completely missed the connection being lost in domestic political insanity. All of us who care for justice in Palestine are so grateful to you for the keen eye and sound voice. Travel on. If only more members of congress had the courage of ex congressman and former presidents. I wonder why it is so much easier to speak truth when out of office! Didn’t our first president in his brilliant farewell address warn us of the dangers of foreign nations who will seek to influence the American people and government? You are in good company Mr. Fawell and thank you Mr. Wall and Mr. Friedman for your focused attention to this critical matter. Bravo, Jim! Right on point once again and at a critical moment. Let us hope that someone in the White House is listening as President Obama gradually recovers his campaign voice and begins again to speak as “we” and not in the singular “I” he has been favoring since his inauguration. Lest we forget, it is not the Republican candidates alone who are curried by the likes of the Adelsons. Thanks, too, to Harris Fawell for being bold enough to tell it like it is for people of conscience who have the temerity to seek to serve the fundamental interests of Americans as members of Congress, as Senators and as Presidents. Let’s hope that there are more like him still willing to run for office, and then give them our support. Jim, I have great respect for Thomas Friedman and his NYT colleague Paul Krugman on the topics of US politics, economics and the Middle East. But I have even more respect for the effort you put into doing additional research to verify their assertions. I rely on your journalistic excellence and integrity to get a truer picture of Israel’s actions in the Middle East and its influence on American politics. I’ve just recommended to all my Facebook friends that they start following your columns, if they don’t already. Thank you, and keep up the good work. Congress listens to those who give them big money, and unless this corrupt system we have changes, Congress and presidential candidates will remain in debted to the biggest doners. This isn’t democracy. If a Zionist like Tom Friedman can see the problems with Adleson and other Israel Firsters buying our government to do Israel’s bidding, then maybe we’re making some headway in getting our message out, although far too little I’m afraid. AIPAC and the neocons are now pushing for war with Iran. Join the Feb, 4th protest in a city near year, to say no to a disastrous war. Go to antiwar.com, at the top of the page, you’ll see the link. It would be great to see Christians, en mass, finally standing up against these horrific wars. Christians, as a group, have been far too silent.